Kids grow up so fast. Now that two of our kids have been adults for several years and our younger three are getting older I'm realizing it even more. My baby is almost 11 and I have one will be getting her driving permit in five months!! That seems crazy to me. 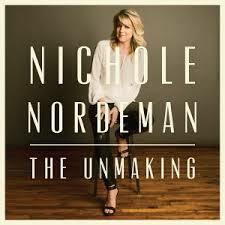 Maybe that's why Nichole Nordeman's new song Slow Down really touches my heart. This CD is about unmaking ourselves so we can do something for God. The day our cd came in the mail we were heading out for some errands, so we put the new cd in & we soon found our favorites. I wanted to listen to Slow Down, but one of my daughters has a thing with listening to a cd from start to finish. After listening to the whole thing the vote from the back seat was continually #5. Something Out of Me is my girls favorite song & I think I like Slow Down the best although it does make me a little emotional. One of my favorites is an older one called Sunrise. i dont have a favorite :) Thank you for the chance! BRAVE has always been my favorite song by her! I really like the song Sunrise -- Just started listening to her on our local station, 95.5 the FISH. I like the song the Unmaking. My favorite song is "Why." I usually sing it on Good Friday at our church. It has such a powerful meaning. Thanks for the giveaway! Sunrise is one of my favorite songs. This new CD sounds wonderful. My daughter says that she likes the song "Sunrise." Sunrise always makes me feel joyous. I love that her music can be enjoyed by our entire family as my kids like the songs too. I love the song "Gratitude." I don't have a favorite song yet. Thanks for your honest review and recommendation and giveaway! kristiedonelson(at)gmail(dot)com Thank you.